Ever since the doors first opened in 1924, Saks Fifth Avenue has been an international fashion icon. The luxury retailer treats customers to an expertly edited assortment of designer apparel for both men and women, as well as handbags, shoes, jewelry, cosmetics and exclusive treasures not found anywhere else. Every year, Saks sees more than a thousand runway shows and showrooms in New York, Paris, Milan and beyond. Only the very best designs make it to Saks Fifth Avenue. 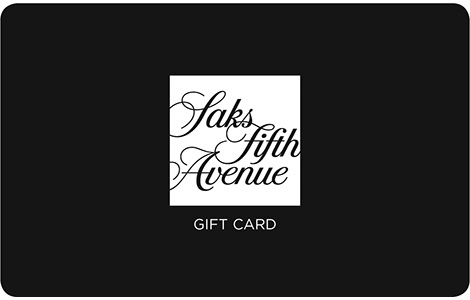 This Gift Card may be used only to purchase merchandise and services sold at Saks Fifth Avenue stores, through 800.347.9177 or at saks.com. This gift card may not be applied to saks.com purchases that are shipped to a non-U.S. address. It may not be used to purchase Gift Cards. This Gift Card may not be returned, redeemed for cash or used as payment or credit toward any credit card accounts. This Gift Card may only be returned by the purchaser with presentation of proof of purchase. Lost, stolen or damaged Gift Cards may be cancelled and replaced with a new Gift Card in the amount of the then-remaining balance upon proof as required by Saks Fifth Avenue. Merchandise Credit, LLC issued this Gift Card. For balance inquiry, call 888.695.4872.